Born on 24th February 1828, in Whitechapel, London, Robert Taylor Pritchett was the son of Richard Ellis Pritchett (c.1782 - 1866) and his wife Ann. His was to be a varied and interesting life. Robert Taylor Pritchett became a gun maker, lecturer, traveller, book illustrator, and watercolour artist. In September 1857 he married Louisa Kezia McRae (d.1899); the couple had a son and a daughter both of whom predeceased him. After his education at King's College School, London, Robert Taylor Pritchett joined the Enfield gun makers of which his father was head. He soon took charge of the royal small arms factory at Enfield and by 1852 he was collaborating with William Ellis Metford (1824 - 1899). They developed and promoted a hollow based bullet for the Enfield rifle. It proved to be effective in trials and Pritchett became famous ( 'the Pritchett bullet' ) when this invention was adopted by the small arms committee and he was awarded £1000 by the government. However, it did not stand up well to the strains of sustained use in the Crimean War (1854 -1856) where it was used from late 1855. Therefore, modifications and further trials were necessary. The abolition of the East India Company (EIC) in 1858 undermined the viability of Pritchett's firm - the EIC had been its main customer, so he forged a career for himself as an artist. He remained a lifelong member of the Gunmakers' Company, lectured on gunlocks and rifles and illustrated 'The British Army' (1868), by Sir Sibbald Scott. Pritchett was an expert on ancient armour and was responsible for dating many pieces in the Tower of London's collection. travelling experience and his desire to do this project. As a watercolourist Robert Taylor Pritchett benefited enormously from the patronage of the Royal Family and in particular of Queen Victoria. She bought two of his watercolours of Scotland in 1868 and went on to commission over eighty of events surrounding her Golden and Diamond Jubilees of 1887 and 1897 and of family events including the christenings of Princess Beatrice and Prince Henry of Battenberg at Balmoral in November 1887. William Ewart Gladstone's lying - in - state and funeral (1898) were recorded by Pritchett. The Queen's death in 1901 ended Pritchett's privileged access to royal occasions and his main source of income. He died on 16 June 1907 at Burghfield, Berkshire and was buried in the churchyard there. In Pritchett's obituary in The Times, 20th June 1907, he is described as, 'a man of strangely varied talent...'. This is an accurate assessment. During the 1860s Robert Taylor Pritchett and his family moved to Esher; in 1871 they lived on Catos Hill. When Elmbridge Borough Council bought 36 Pritchett drawings in May 1985 the 'Esher News & Mail' described him as, '..an eminent local man..' and ' one of the benefactors of Esher ....' His work was already known to the Royal Family when the Queen's daughter, Princess Louise and Lord Lorne visited Pritchett's home in 1870. Two years earlier he had been given permission to do drawings of Claremont; Queen Victoria purchased sketches of Esher. 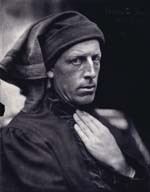 Examples of his work are in the Royal Collection and at Elmbridge Museum. The latter's collection includes many fine pen and ink sketches of Esher and Esher Place made by the artist in 1868: the Lodges, Esher Place; the Towers; the Bear Inn; the Traveller's Rest and Claremont.